…laughter tinkled among the teacups. The delights of the table (as always, let’s talk about the food first) began with a champagne toast, proceeded to a brunch which consisted of two kinds of Jane’s quiche and Caroline’s Waldorf Salad and scones with creme fraiche and homemade jam. The occasion finished sweetly with tarts, tea and laughter. The beautifully appointed Autumn table was further adorned by charming guests. The ladies present represented various vocations and avocations; among them, a woodworker, a vintage inspired dress designer , a couple of graphics artist and a bee keeper or two. Needless to say, the conversation was both varied and lively. Invitations and place cards made by Jane and Caroline bore images of hats. Interestingly enough, though there was no mention of hats as a dress code requirement, most every guest wore one; and, as would be expected, several of the hats were Singer designs. 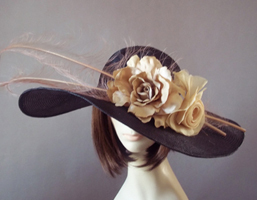 Polly herself wore Blythe Spirit, a wide brimmed black hat banked with yellow silk flowers. One of the hostesses wore Audrey at Ascot. Though officially fall, it’s still quite warm in Kentucky; transitional hats, natural straw trimmed in darker colors, black, bottle green or plum for instance, were the overwhelming choice. Hats featured in this month’s Victoria Magazine are from the Singer fall and winter collection. 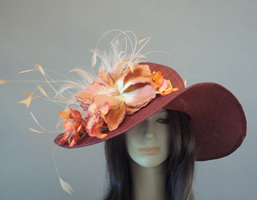 The hat created for Tea Time is a new design, Fall Romance. To see the layouts and learn more about Polly’s contribution, scroll down to Hat Chats entitled Hats Off to Victoria and A Hat for Tea Time. Both magazines are currently available on the stands. We wish to thank Caroline and Jane for the kind tribute and delightful morning. It’s currently 73 degrees, one can hardly interpret this as a nip in the air, however, it is enough of a drop to remind us that fall is just around the corner. How to celebrate? Rebecca suggests buying a new hat. 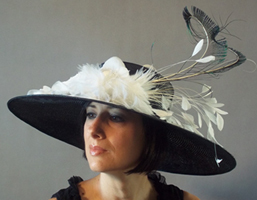 We were delighted to note that she also recommends that her readers visit Polly’s website for an original couture hat. I’d also like to call your attention to our vintage pieces. Several of the newly posted vintage hats are perfect accessories for fall fashions. I Spy and Washington Square are treasures from the 60’s and 70’s. Both hats have timeless silhouettes and are in paler earthtone hues that that are always popular in cooler months. Personally, I can think of no more charming way to add wit to an outfit that with a vintage hat. Zuri, is another new autumn design worth looking at. Zuri, Elizabeth’s Cheetah with bells and whistles, is a jaunty animal print fedora festooned with feathers. The hat has it all; color, texture, movement and reminds me of a number of similar styles accessorizing Ralph Lauren’s fall collection. I love summer dearly and am always sorry to see it go. The prospect of finding the perfect hat for cooler weather may one of the season’s most rewarding compensations. I wish you all a happy Hat Month and happy hunting. It was a pleasure to have 4 hats featured in the September/October issue of Victoria Magazine. I was contacted back in June to provide 4 hats for the fall layout. Little did I know that they would be featured so prominently in Victoria! It has been such a thrill for me since Victoria is one of my all time favorite magazines. I have always been a huge fan of Victoria Magazine. Back in the late 80’s, I was an original subscriber. The magazine inspired me and perhaps, led in many ways to my becoming a hat designer. The photographs and hats were lovely, timeless and beautiful. To view the individual hats, you may use the following links to see the hats on our website. The September/October issue of Victoria has some other wonderful articles of interest, one being the store “Tail of the Yak” in Berkeley, California. I urge you to pick up this issue as it is a visual treat. It makes one yearn for fall and all its abundant treats. For more information on Victoria Magazine, please visit Victoria Magazine. Working with a limited cache of materials on a tight deadline, a deadline which came on the heels of months of tight deadlines does not make for ideal working conditions. This was the situation when Polly was asked by a magazine stylist to create a hat for a photoshoot. In June, soon after the Kentucky Derby rush Polly received a commission from Tea Time, a magazine devoted to “the many delights of taking tea”. She was asked to fashion a Victorian style hat to be used as a prop in a photo illustration for an article entitled Hats off to Mrs. Beeton, a piece about Beeton’s Book of Household Management, an 1861 publication on the proper running of a household. As for flowers, a couple of nosegays in aubergine velvet were unearthed. But the hat still lacked a focal point and needed an element of bright color to offset the rich browns and plums. Since none of the silk flowers which are the mainstay of her more elaborate designs were available in an autumn palette, Polly took a large scrap of pumpkin hued silk and used milliner’s magic to fashion it into a cabbage rose that could have been the pride of any Victorian English garden. One of the real treasures from the Singer “I may need this someday” archive was a cluster of glass beaded grapes which when added to the hat provided a subdued bit of bling and served to bridge the dark tones of the hat and the brighter orange rose. Tea time magazine was delighted with the result and featured a full page photograph of the hat on page 24 of the September/October issue. This issue is currently on the stands, we invite you to admire the result of our scavenger hunt and enjoy the usual entertaining and informative fare Tea Time has to offer. We are so pleased with the hat, we gave it a name, Fall Romance and entered it in the Polly Singer fall collection.